Hopelessly Devoted Bibliophile: Fictional Places with Elizabeth Isaacs, AND A GIVEAWAY! Fictional Places with Elizabeth Isaacs, AND A GIVEAWAY! Elizabeth Isaacs, author of The Light of Asteria, is here to share a little bit about herself! I asked her what 10 fictional places she'd visit if she could. Tough question right? Well I think she chose amazingly well, if I do say so myself. Take a look! 10. Whoville from How the Grinch Stole Christmas by Dr. Seuss— Not just whoville, pretty much any world of Theodore Geisel. I’d really love to see where the Lorax lives, or Mulberry street. What about where Horton lives, or a place where they eat green eggs and ham? Number ten is devoted to the wonderful worlds of Dr.Seuss. 9. The Land from Stephen R. Donaldson’s The Chronicles of Thomas Covenant—This one’s a bit obscure, I know, but I read the series in college and never quite got over it. I’m not sure the books are still in print, but if they are you should really check it out! 8. The Island from Robinson Crusoe by Daniel DeFoe—Thanks to required reading lists everywhere, some people cringe when you mention this book. It was written in the 1700’s, so I know it isn’t exactly a quick read, but I love the setting. It’s always captured my imagination. 7. The moors and the estate of Wuthering Heights by Emily Bronte—this is one of the few books that I liked the setting way more than the plot. Again, another high school read that causes most kids to groan, and even though I haven’t re-read it in a while, I still remember picturing the landscape in my mind. 5. The Lands of Eragon by Christopher Paolini— I’d love to see the star sapphire of Farthen Dur, and, of course, visit Ellesmere. If we could meet a dragon or two along the way, that’d be fine with me! 4. The hotel in Tempt me at Twilight by Lisa Kleypas—I know this one is off the beaten path, but I’ve been enjoying a bit of historical romance this summer. I’d love to see The Rutledge hotel and London in the mid 1800’s. I’m sure the smell would knock me over, but it’d still be interesting. 3. Narnia in The Chronicles of Narnia by CS Lewis—We can’t begin to discuss world building without Narnia. CS Lewis was a genius! 2. Hogwarts in Harry Potter by JK Rowling—Who doesn’t want to visit Hogwarts? If I could, I’d love to watch a quidditch game, but I wouldn’t want to play. I’m not exactly coordinated on the ground, so I know the air would be disastrous. 1. Middle earth in The Lord of the Rings by JRR Tolkein— I’ve heard there’s a forest in Ireland that Tolkein went when he wrote. I want to go there someday, but even if I could, I’d still love to see through his imagination. Fully agree on ALL of these! I'd especially love to dive into the real Middle Earth, and sneak my way across Mordor. Wow, that would be amazing! Thanks Elizabeth for sharing :). 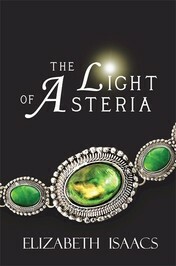 Elizabeth was sweet enough to bring along 2 Ebook copies of The Light of Asteria for you lovely people to win! Make sure to thank her in the comments, will you? To win, FILL OUT THIS FORM.